Some of the Penn Libraries’ unique Japanese holdings, like our set of Okinawan Bibles or our collection of early 20th century pulp historical fiction, are legacy items donated decades ago and just recently rediscovered. Others, like the corporate history resource Mieki (a magazine dedicated to a brand of industrial soy sauce additive), have been purchased specifically for our community of researchers. But rarely do we have the opportunity to work directly with those researchers to acquire bibliographic treasures that document Japanese history. 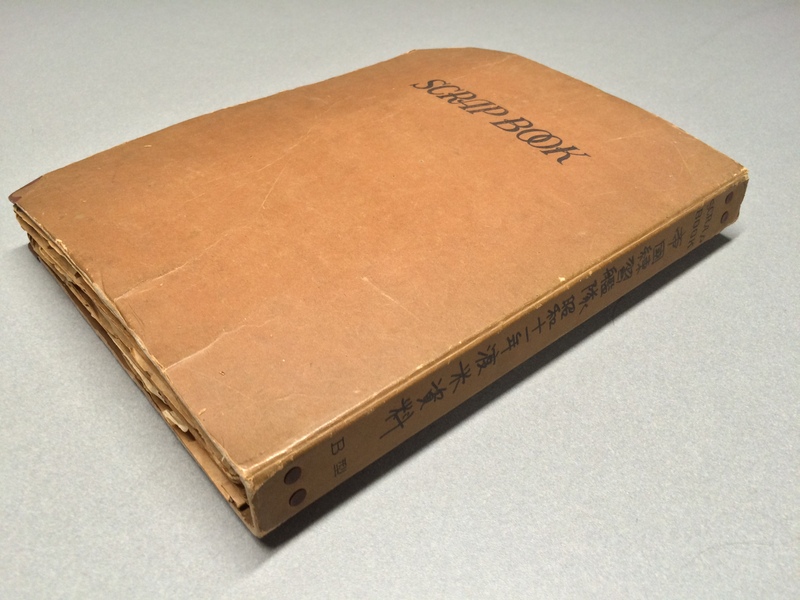 In 2015, Penn Ph.D. candidate Robert Hegwood, a scholar of Japanese/American cultural relations in the mid-20th century, purchased a rather innocuous looking “Scrap Book” at a used book store during a stay in Tokyo. Inside this commercially-produced scrapbook is a collection of postcards, welcome booklets, travel ephemera, and training documents collected by an unidentified Japanese sailor of the Renshū Kantai 練習艦隊, the Japanese Imperial Navy’s Training Fleet, during a 1936 voyage to the United States. From 1903 to 1940, the Renshū Kantai took such training deployment cruises almost every year, with graduates of the Imperial Japanese Naval Academy, the Naval Engineering Academy, and the Naval Paymasters Academy spending several months traveling around the Pacific Ocean, occasionally venturing as far as the Mediterranean Sea or the East Coast of the United States. The 1936 cruise (lasting from June 9 to November 3) saw Vice-Admiral Zengo Yoshida commanding the ships Yakumo and Iwate as they sailed across the Pacific Ocean from Yokosuka to Seattle, down along the West Coast and up through the Panama Canal as far as New York City. Unfolding “Scrap book: Teikoku Renshū Kantai Shōwa 11-nen Tobei Shiryō”. Photography and animation courtesy of Chris Lippa. 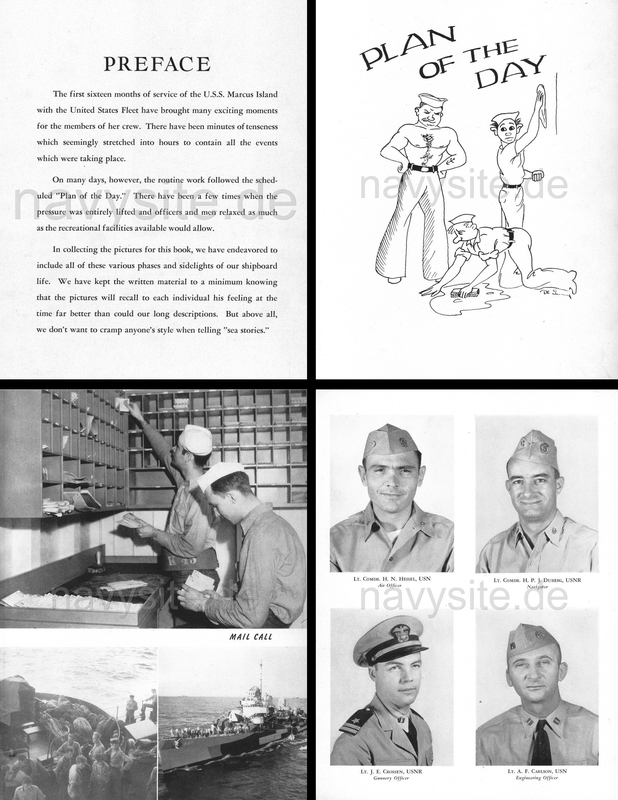 Selected pages from USS Marcus Island (CVE 77) World War II Cruise Book, 1944-45, hosted at navysite.de. This certainly seems true of cruise books produced by ships of US Navy. Thoralf Doehring’s US Navy Cruise Books, a massive digital trove of over 900 US Navy cruise books, asserts that “[t]his tradition dates back to the late 1800s” and that “10,000 different US Navy cruise books have been published.” The oldest item on Doehring’s site is the cruise book of the USS Marcus Island from 1944-1945—right in the thick of World War II—which nevertheless aims not to “cramp anyone’s style when telling ‘sea stories.’” The book is indeed charmingly amateurish and light-hearted, with illustrations and photo layouts not unlike those of a student-produced yearbook. But the cruise books of the Renshū Kantai are much more official in tone, featuring celebratory calligraphy commissioned for the publication, staid portraits of commanding officers, and decorated gilt edges. The colophons of these books generally lack formal publishing statements in favor of printing statements, a technique common in Japanese self-published works. Many declare themselves hibaihin 非売品—“goods not for sale”. It’s unclear how these books were financed and distributed, but perhaps like shashi, Japanese corporate history books, they were part of the fleet’s budget and even purchased by the sailors themselves as souvenirs. 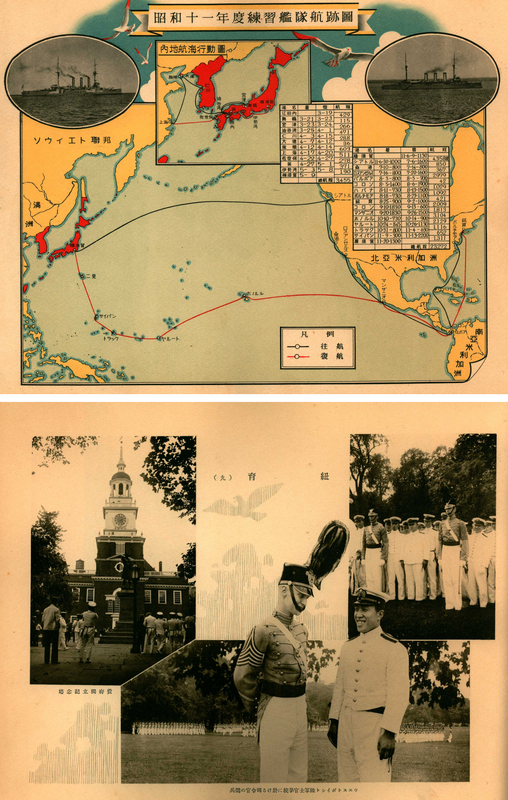 Cruise books like the 1936 edition are certainly detailed, official-enough records of the Renshū Kantai’s annual itineraries, highlighting milestone events at different ports-of-call with photographs of ceremonies and reprints of speeches of dignitaries. The 1936 book even shows some photographs of the ship’s physician in action, and of a line-crossing ceremony held at the Antimeridian. But these books don’t show the full scope of life on on the sea for newly-minted Japanese Naval cadets. They don’t reprint, for example, selections from “ship newspapers” like the Yakumo Shinbun, an internal newsletter produced in new editions each time a ship was deployed. They also don’t attempt to capture the experience of being a tourist abroad. Selected pages from cruise book Shōwa Jūichinendo Renshū Kantai Junkō Kinen (1937). Note the appearances of West Point and Philadelphia’s Independence Hall as tourist destinations during the fleet’s stopover at New York in late summer, 1936. The 1936 scrapbook, on the other hand, is a snapshot of what might be a typical sailor’s experience as told through ephemera. Picture postcards of scenic and historic sites are interspersed with commercial guidebooks and even mimeographed documents to teach sailors about Cuban culture. Of particular note, are the Japanese-language welcome materials produced by local Japanese associations in the US to celebrate the arrival of the fleet, like Renshū Kantai Kangei Seito Sakubunshū 練習艦隊歡迎生徒作文集—collected student compositions of the Tacoma, Washington Japanese Language School—or Teikoku Renshū Kantai Kangei Kinen 帝国練習艦隊歓迎紀念—a guide to the history of Los Angeles and a directory of Japanese citizens living there. The bilingual Rafu Shimpo: L.A. Japanese Daily News 羅府新報, released a commemorative number welcoming the Renshū Kantai, also revealing some of the cultural misunderstandings their arrival created. Prominently featured on page one of the July 15, 1936 issue is a brief article about how American women invited to tour the Yakumo and Iwate had mistaken the uniformed sailors as “elevator boys, chauffeurs, and houseboys,” even trying to offer the sailors cash tips. For many of these Japanese living in the United States, the chance to mingle with compatriots from abroad would be irresistible, as the Immigration Act of 1924 had prohibited Japanese immigration to the US. Barred from citizenship because of their race and separated from their homeland by the immensity of the Pacific Ocean, local Japanese gave the best welcome they could to the men of the Renshū Kantai. These enclaves of the Japanese in the US, in fact, almost appear as quasi-colonies in the Renshū Kantai’s cruise books. Los Angeles is often represented in Chinese characters as “Rafu” 羅府, and San Francisco as “Sōkō” 桑港, somewhat akin to how the Japanese Empire had redubbed Seoul, Korea as “Keijō” 京城. “Welcome Midshipmen of the Japanese Training Squadron”. Headline from the Californian newspaper Rafu Shimpo, July 15, 1936. Image courtesy of Robert Hegwood; original material from the Kasai Family Papers held at UCLA Library. These fledgling cultural colonies were soon to be abandoned by their empire. The year 1936 would be the last visit of the Renshū Kantai to the continental United States, though the Iwate and Yakumo would return to the pre-statehood Hawaiian Islands in late 1939 in the fleet’s penultimate cruise. The final voyage of the fleet occurred between August 7 and September 28 of 1940, concluding just one day after the Tripartite Pact was signed by Germany, Italy, and Japan. With the Axis now fully tilted against the Allies, there was no time for training cruises or tourist scrapbooking for Japan’s naval forces. Meanwhile, many of the Japanese who had so warmly welcomed their compatriots in previous decades would soon become prisoners of war, stripped of their property and placed in internment camps—citizens of nowhere. While the imprisonment of Japanese and Japanese-Americans is a dark and shameful chapter in American history, those interned were far from broken. They even compiled scrapbooks of their own experiences, like the Kooskia Internment Camp Scrapbook held at the University of Idaho Library. After Japan’s defeat at the end of the Pacific War, the Navy and its Training Fleet were officially abolished, with Japan renouncing “war as a sovereign right of the nation and the threat or use of force as a means of settling international disputes” in Article 9 of the 1947 Constitution. This did not, however, prohibit the creation of a well-trained military force for defense purposes, and in 1954 the Japanese Maritime Self-Defense Force, or Kaijō Jieitai 海上自衛隊, was formally established. This new not-quite-Navy has its own “Renshū Kantai,” which as of this blog post’s publication is on its 60th voyage. Their 20th anniversary publication, Enkō Nijūnenshi 遠航二十年史 (“Twenty Years of Voyages”), makes no reference to their imperial predecessor, rewriting the history of Japan’s military presence on the seas as one of a peacekeeping force. The Penn Libraries, however, will continue to expand this unique collection, and make the history of the Renshū Kantai accessible for generations to come. Welcome to Unique at Penn, part of the family of University of Pennsylvania Libraries blogs. Every week this space will feature descriptions and contextualization of items from the collections of the University of Pennsylvania Libraries. The site focuses on those materials held by Penn which are in some sense “unique” - drawn from both our special and circulating collections, whether a one-of-a-kind medieval manuscript or a twentieth-century popular novel with generations of student notes penciled inside. See the About page for more on the blog and to contact the editor. The conclusions and views presented on posts within“Unique at Penn” reflect those of their writers and do not represent the official position of the University of Pennsylvania or the University of Pennsylvania Libraries.